The Sony a6500 is here, and it is here to please. This slim-built camera is the best of all worlds in an era where everyone is a photographer. This sleek machine is slim and compact but packs a big punch. Continuous autofocus makes capturing the unexpected quick and easy, while an onboard image stabilizer ensures consistent quality with each click. Factor in the ability to shoot 4K video, and you have a tool that will be as perfect for the blossoming vlogger as it will be for the parent that doesn’t want to miss one single moment. The Sony a6500 doesn’t come cheap. With a price tag that approaches four digits, it won’t be for everyone. However, if you are willing to pay a little more, you may find plenty to like. Let’s explore the ins and outs of this impressive camera to see if it will be for you. As we mentioned in the introduction, the Sony a6500 is of a relatively slim build. Though not sized to fit your pocket, the low-profile design of the camera makes it good for on-the-go use. The body of the camera features a width of 4.75 inches, a height of 2.75, and a depth of 2.13 inches. Complete with a weight of only one pound, the a6500 will not be overly cumbersome for a day out exploring. It is also worth mentioning that this is a mirrorless camera. If this phrase doesn’t mean much of anything to you, that is ok.
Mirrorless cameras are the cousin to the ever-popular DLSR options. A mirrorless camera benefits from easily interchanged accessories, and a slim build. They also usually are able to shoot better video than a DSLR. DSLRs, on the other, hand feature more options with their hardware accessories, but they are also a little bit more complex. If you are a hobbyist, you will probably favor the DSLR. If you are just the type of person that wants to capture life’s tender moments, you will appreciate mirrorless options like the Sony a6500. The camera also features a nearly three-inch LCD monitor with a sharp color resolution to ensure high-quality onboard viewing of your pictures. 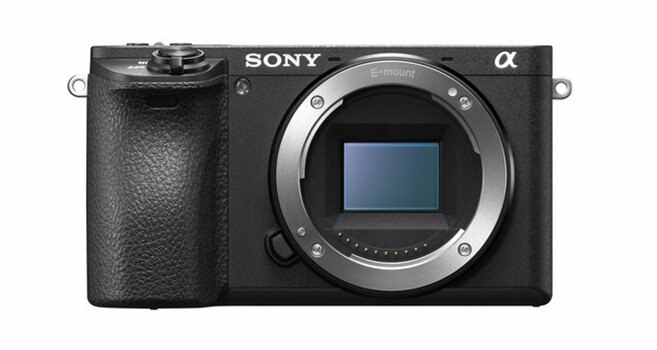 The a6500 utilizes Sony’s Exmor CMOS sensor. Let’s now look at some important features regarding the specs and performance of the a6500 to give you a better idea of what it is about. The 24.2MP that you get with the Sony a6500 ensure that you will be able to get the quality that you want regardless of the size of your eventual print. Granted, the actual impact of megapixels is contingent on other variables that occur throughout the make of the camera. Still, a high megapixel count lays a solid framework for good picture taking, so the 24 that we see here is nice. To put this matter into context for you, the iPhone camera has a seven-megapixel resolution. ISO essentially refers to the sensitivity of your sensors to light. ISO is one of the main factors (in accordance with shutter speed and aperture) that go into determining the exposure of your photograph. An expansive range of ISO settings makes it possible to get high-quality photographs in situations with lots of light, and situations with almost none at all. When you have a lot of light to work with, you can put the ISO setting on low, while the reverse is true when light is sparse. The wide range of settings that you get with the a6500 ensures that it will be perfect for taking good photographs at any hour of the day. Whether you need to preserve a sporting event, or just capture the daily activities of little ones that won’t slow down for anything, it can be helpful to have a high frame per second threshold. An fps rating of 11 ensures that you will be able to enjoy detailed photographs of even fast-paced moments. Phase detection is one of the most complex aspects of the camera, and it is also the focal point of most upgrades that we see on a yearly basis. As it stands at the moment, the a6500 actually leads in its class of camera for point phase detection with 425. The dense number of concentration points means that you can confidently capture anything from a tranquil photograph in the park to the fast-paced action of your daughter’s soccer game with the same confidence. Last but not least, the Sony a6500 equips users with the ability to shoot 4K video. More than a few steps up from your family camcorder, or even your cell phone for that matter, 4K video comes pretty close to the gold standard these days. For home videos or even content that might make you the next YouTube sensation, it is nice to have access to equipment that can shoot media this data rich. In addition to the specifications that we have listed above, there are a few other features you will want to keep in mind regarding the a6500. For one thing, as mentioned in our introduction, the camera features continuous autofocus. This means that the camera will naturally adjust to take photographs on a moment to moment basis. It also features a pop-up flash that is stored onboard and a port that can accommodate a separately sold external flash. Last, it features a battery that will be able to take up to 350 shots before requiring a recharge. It is true that there is a paywall that will be cumbersome to some budgets. In the world of photography, you often get what you pay for, though. If you have the money in your budget, think about letting the Sony a6500 document your family’s adventures.